Sorry everyone! So this is a picture of me at C.E. Budd Middle School. 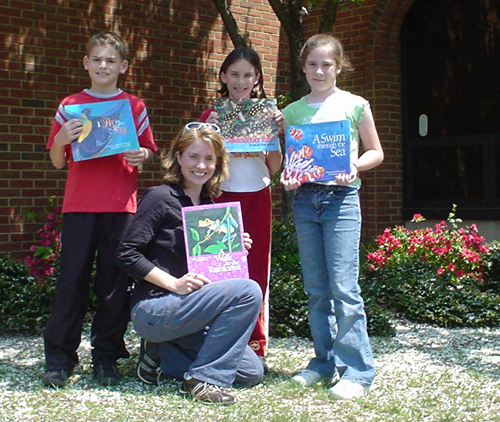 (I know it’s hard to tell which one of us is not in middle school…I’m the one holding the book.) The kids were awesome. I think it’s sometimes fun to talk with the “big kids” because they are at a point when they can start to realize their education belongs to THEM. So what are you going to do with it, kids? 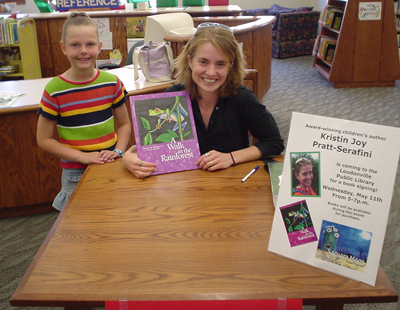 Tonight, after speaking with the McMullen students during the day, I came back to the library for a book signing. It was a fun time. There wasn’t a huge crowd, but it gave me an opportunity to talk a little more with the students who were really interested in writing or illustrating. I brought copies of my new book about journaling, Words With Wings, and sold a few. After the signing, my host teachers took me out to a cute little cafe for a delicious dinner. Thanks, everyone! Hi from Loudonville, OH! This trip was a delight for many reasons. The only thing that was not so fun was how the airlines misplaced my luggage on a direct flight from St. Louis, MO to Columbus, OH. Urg. But that’s the first time in 12 years of author visits, so I can’t complain too much. Anyway, The good things about this trip far outweighed this minor disaster. Today, I spoke with the K-3 students of McMullen Elementary, and as you can see from the photo above, these kids are very creative. They also decorated the doors of each classroom throughout the building with artwork relating to my books. What fun. One thing that made it easier for me to do my presentations was the fact that there’s a wonderful public library across the street from McMullen (K-3) and C.E. 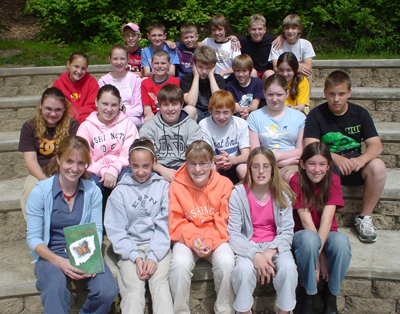 Budd (4-6) schools. So instead of moving from class to class, I set up in a conference room in the library, and the students from both schools came to visit me. I think the idea of a mini-field trip helped the kids be on their best behavior. Today I worked with the McMullen students. They were wonderful. For lunch, the teachers prepared an ABC buffet. Each teacher brought a dish starting with a different letter of the alphabet. I got a chance to visit with the teachers about their students’ writing projects and some of my upcoming book ideas. 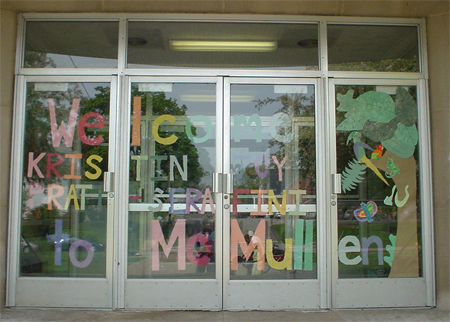 Thank you, McMullen Elementary! On the afternoon of 5 May, I spent some time talking with 2 groups of upper elementary students. In Florida, there is a significant writing component that has been added to the 4th grade level standardized tests, so they are practicing all the steps of the writing process: deciding on a genre, brainstorming, rough drafts, editing, more editing, reading out loud, and finally the finished work. 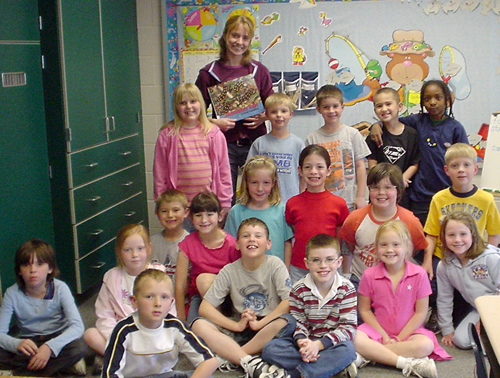 I spoke at this school in 2001, so some of the students remembered seeing me when they were in kindergarten or first grade. 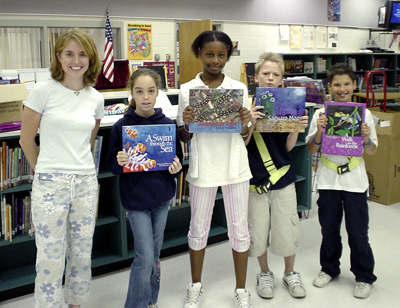 But they hadn’t seen my two newest books, Saguaro Moon: A Desert Journal(2002) and Words With Wings(2005), so it was fun to share them with the students. Thanks, Country Hills! Today I visited Park Trails Elementary School. 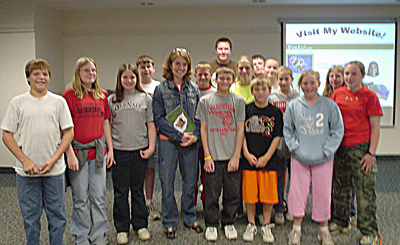 Mrs. Marino had been planning this visit since August 2004, and I was excited to finally meet her, and the students! (She also gave me some good tips on how to share my Spanish language translations of A Walk in the Rainforest and A Swim through the Sea with students in her area, so thanks for that!) Park Trails is a very nice school, and huge! It is located in a growing part of Parkland, and had a student body of about 1500 this year. Because of the school’s size, the schedule had to be configured so that I spoke to 2 groups on the morning of 4 May, and 2 more on the morning of the 5th. It was hard to take questions when working with groups of over 400 students at a time, so I was happy to visit with some of the more interested students between presentations, and during the autographing session in the library. Thank you, Park Trails! 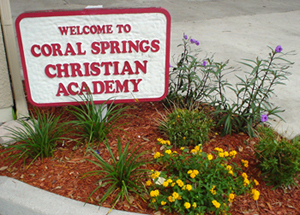 The Coral Springs Christian Academy added on to my school visit trip at the very last minute – about a week or two before I left for Florida. I am so glad it worked out to visit with these students! I did one presentation in the afternoon with the 2nd and 3rd graders. It was a little warm, and the students were kind of squished into a small room, but even at the end of the day, the kids were very well behaved. They sat quietly and asked some really interesting questions. They are definitely getting ready for 3rd and 4th grade! We talked about writing, illustrating, inspiration, using our talents to help our communities, and doing our best work. Many of the students came up and talked with me afterwards, and I got several emails from them asking for advice about writing and getting published. Thank you, CSCA! Hi from Florida! A great place to visit in the spring… I spent the day speaking with the students at Starlight Cove Elementary, and these kids were marvelous. I started the day with a surprise appearance on the Starlight Cove morning news program. Then I spoke in the library, and the groups were pretty large. The last group of the day was a mix of 3rd and 5th graders. They were totally impressive. They filled the entire library, and sat very quietly for almost an hour. Good job, kids! A special thank you to Sharon Pomerants & Christie Connors for setting up this day at the last minute.